How could I possibly resist a mashup of so many of my favorite genres, with a dash of romance thrown in for good measure? Mary Quinn, rescued from her fate and enrolled in a girls' school that turns out to also house a secret detective agency, is placed as a companion to a spoiled girl as her first assignment. While investigating--often causing more problems than she answers questions--she encounters the equally inquisitive James Easton and finds some unlooked-for answers to buried questions from her past. But mostly she pokes her nose into everything, whether she's supposed to or not. 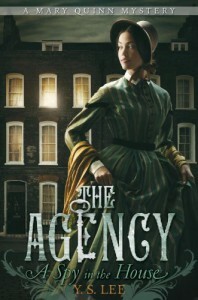 As Lee says, "The Agency is a totally unrealistic, completely fictitious antidote to the fate that would otherwise swallow a girl like Mary Quinn." I'm glad to have the sequel already in my hot little hands.